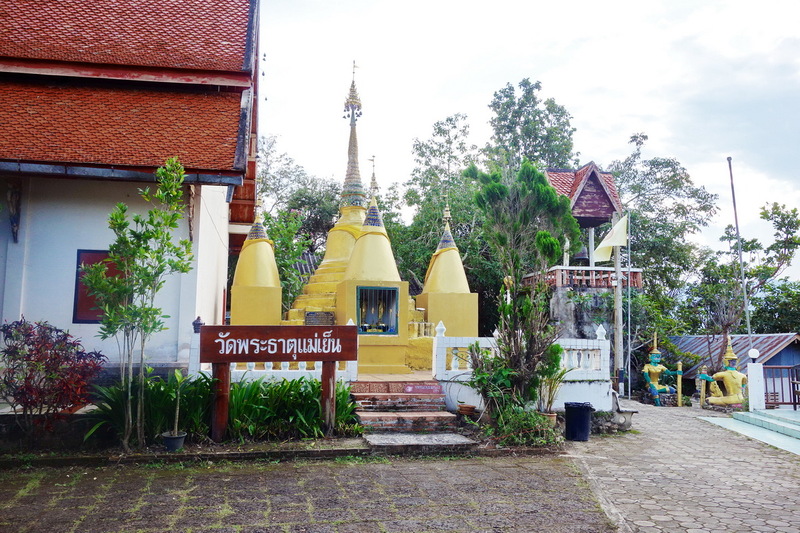 Mae Yen Temple or Wat Phra That Mae Yen is one of a landmark of Amphoe Pai. 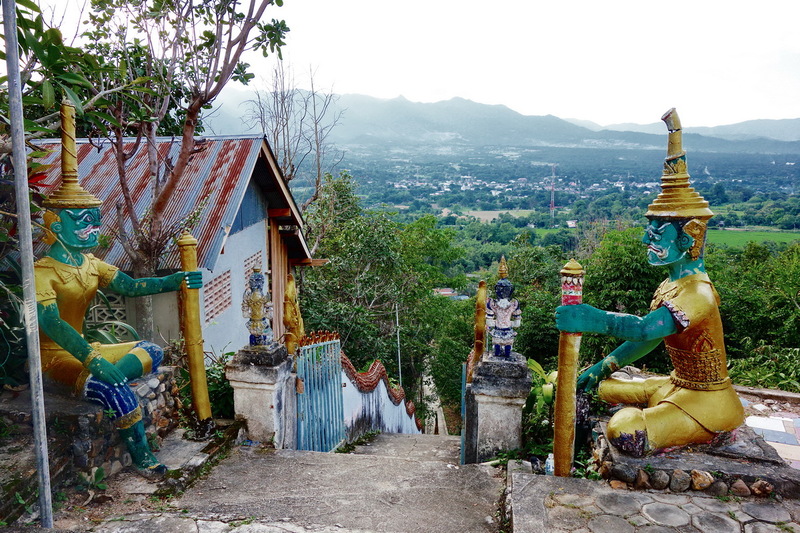 Mae Yen temple is a small temple sits on a hill 2 km from Pai is especially interesting for its setting and the view overlooking the city you have from it. 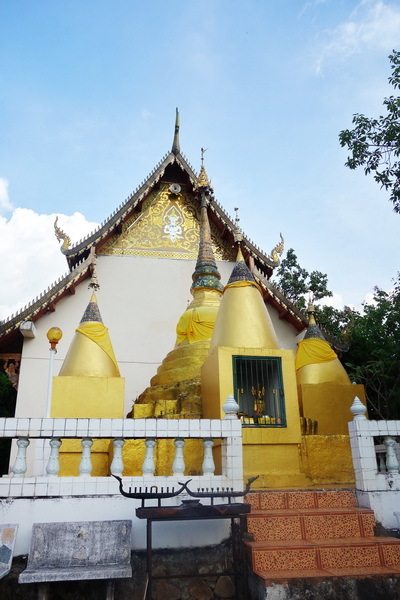 The temple complex includes two buildings as well as a little golden chedis. A graceful white Buddha greets you, along with some smaller, colorful statues. 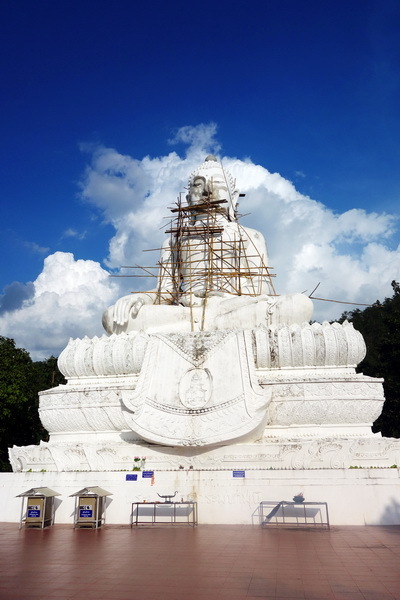 There is a beautiful Big Buddha Statute on the hill, you can take a full view of Pai from here too, The view here is amazing with stunning sunset during evening, is a must visit attraction in Pai. The statute is still under construction, the staircase is not ready yet, but you still can access it by hiking the small trail use by the construction workers. Is not too high, just a short distance of hiking. But you should to prepare some water to refresh yourself. Tourists usually come up to see the view, and worship the Reclining Buddha image before their back trips. 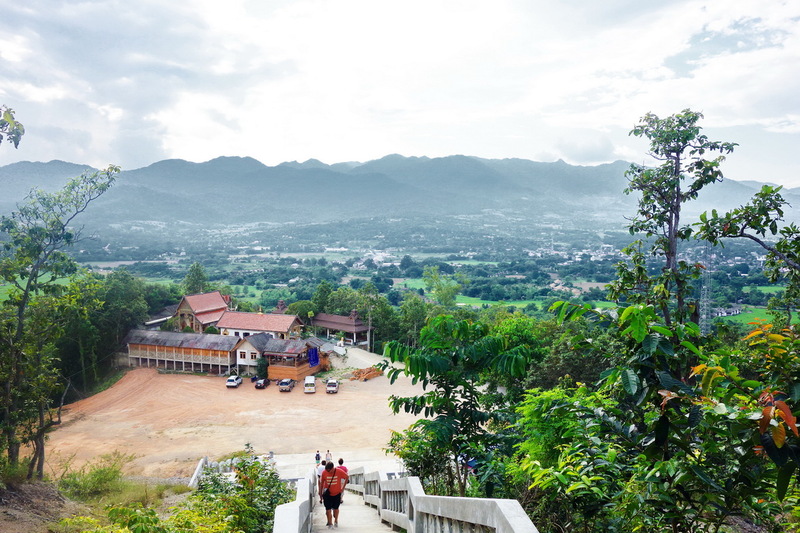 The 353 steps long staircase to reach the temple is charming even if you can skip it and take the road to access to Phra That Mae Yen. Within the temple area, there are only Phra Ubosot. At the back of Phra Ubosot is a Chedi. There was no obvious evidence on the time it was built. The Chedi have 3 meter high white bell shaped pagoda, with a round pedestal, and the outstanding umbrella-shaped top in Burmese style. Tourists usually come up to see the view, and worship the Reclining Buddha image before their back trips. Mae Yen temple is the place where worth a visit and do worship. 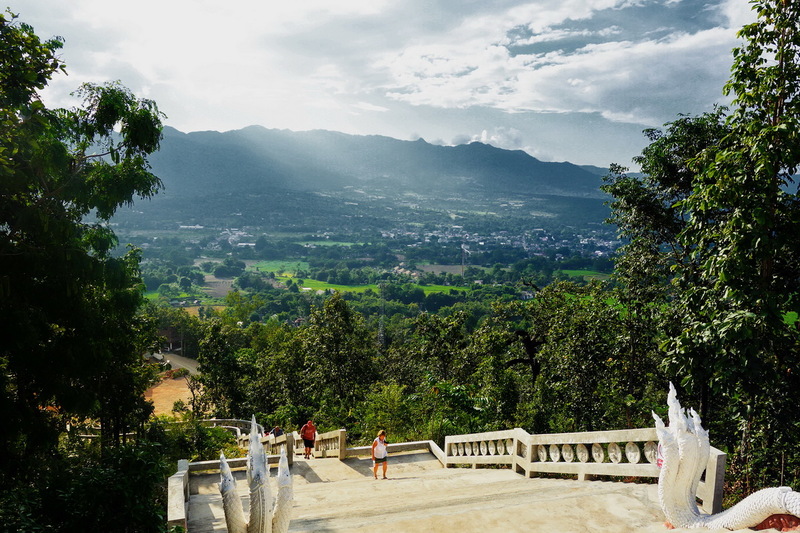 Normally, tourists usually climbed up to Wat Phra That Mae Yen in the evening in order to get a charming scenery of Amphoe Pai. From this point, visitors can get a whole view of the town. Since the temple is located not far from the town. 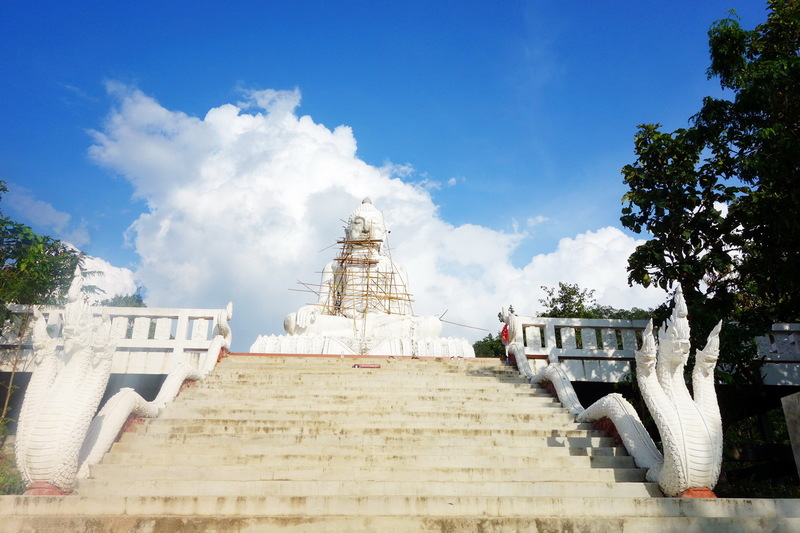 Mae Yen temple is located on the hill, in the east, behind Mae Yen village. 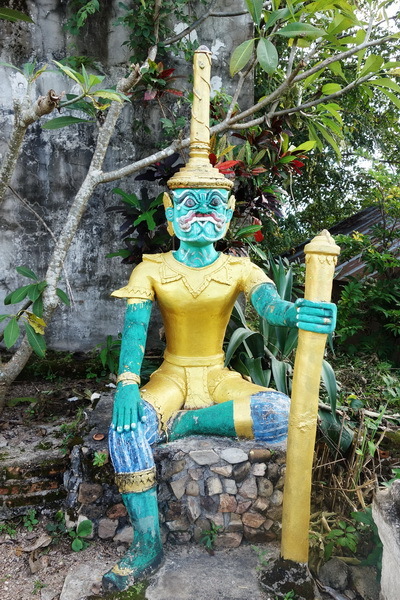 This temple has stood in Amphoe Pai for a long time. Located on the hill, in the east side of Amphoe Pai, it is 2 kilometers away from the District Office.